Enjoy 3 for 2 on Ecooking. 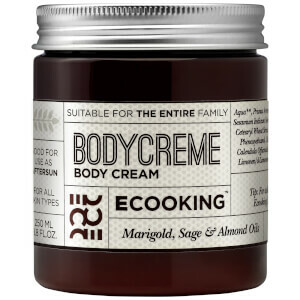 Discover top-to-toe nourishment with Ecooking Body Cream, a rich and velvety moisturiser suitable for the whole family. Powered by a natural cocktail of ingredients including Chamomile Extract, Almond Oil and Aloe Vera, the silky cream sinks into skin to restore high levels of hydration deep below the dermal layer, helping to soothe any irritation and create soft and supple results. The 100% vegan formula will leave the whole body feeling smooth, nourished and rejuvenated. 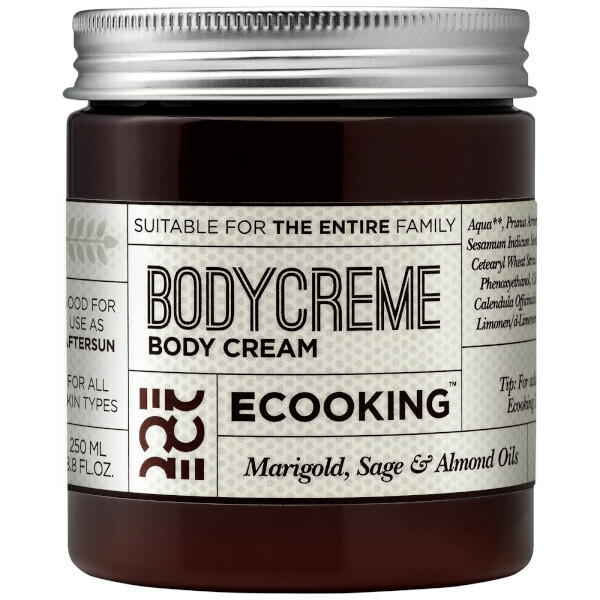 Ecooking Body Cream can be used by the entire family and all skin types. Can be applied to the entire body and face. Aqua**, Prunus Armeniaca Kernel Oil*, Prunus Amygdalus Dulcis Oil*, Sesamum Indicum Seed Oil*, Simmondsia Chinense Seed Oil*, Glycerin*, Cetearyl Wheat Straw Glycosides, Cetearyl Alcohol*, Ethylhexylglycerin, Phenoxyethanol, Citric Acid, Prunus Barbadensis*, Salvia Sclarea*, Calendula Officinalis Seed Oil*, Parfum**, Geraniol**, Citronellol**, Limonen/d-Limonene**, Linalool**. Please Note: There may be small discrepancies between the declaration of content on our website and the received product, since the brand continually improve the content of their products as to the newest knowledge on the impact of contents on the environment and health.